Return a cummingsified version of the poem. In this way we simulate a more complicated algorithm that sometimes fails in unexpected ways. Print the cummingsified (lower-cased) version of the poem. Print “Cummingsify failed!” followed by the original poem. Although we have retained the ability to download from multiple servers, when you are testing out client 5.0 it’s easier to just use a single server and run the program multiple times, until you see all three different outcomes. Also try running the client on a port with no server. Note the pass-through errback that gets added by addCallback. It passes whatever Failure it receives onto the next errback (poem_failed). 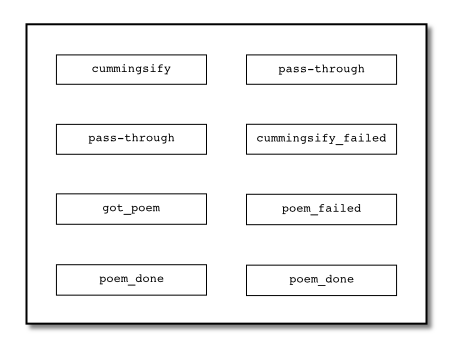 Thus, poem_failed can handle failures from both get_poetry (i.e., the deferred is fired with the errback method) and the cummingsify function. Also note the hauntingly beautiful drop-shadow around the border of the deferred in Figure 19. It doesn’t signify anything other than me discovering how to do it in Inkscape. Expect more drop-shadows in the future. In this case no callback fails, so control flows down the callback line. 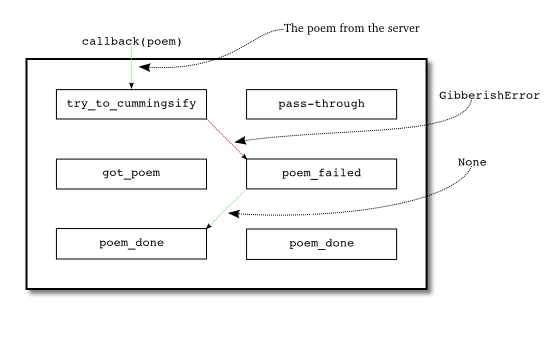 Note that poem_done receives None as its result, since got_poem doesn’t actually return a value. If we wanted subsequent callbacks to have access to the poem, we would modify got_poem to return the poem explicitly. Since the try_to_cummingsify callback re-raises a GibberishError, control switches to the errback line and poem_failed is called with the exception as its argument (wrapped in a Failure, of course). And since poem_failed doesn’t raise an exception, or return a Failure, after it is done control switches back to the callback line. 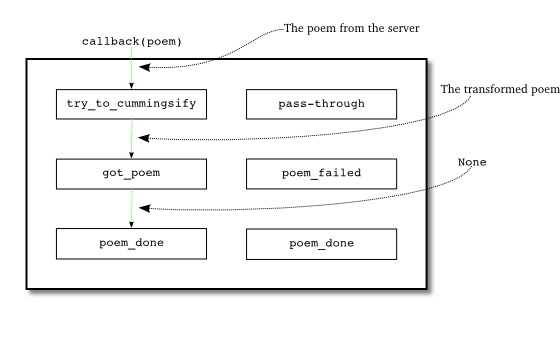 If we want poem_failed to handle the error completely, then returning None is a reasonable behavior. On the other hand, if we wanted poem_failed to take some action, but still propagate the error, we could change poem_failed to return its err argument and processing would continue down the errback line. Note that in the current code neither got_poem nor poem_failed ever fail themselves, so the poem_done errback will never be called. But it’s safe to add it in any case and doing so represents an instance of “defensive” programming, as either got_poem or poem_failed might have bugs we don’t know about. Since the addBoth method ensures that a particular function will run no matter how the deferred fires, using addBoth is analogous to adding a finally clause to a try/except statement. This is the same as figure 20, except got_poem receives the original version of the poem instead of the transformed version. The switch happens entirely inside the try_to_cummingsify callback, which traps the ValueError with an ordinary try/except statement and returns the original poem instead. The deferred object never sees that error at all. As before, poem_failed returns None so afterwards control switches to the callback line. In client 5.0 we are trapping exceptions from cummingsify in our try_to_cummingsify callback using an ordinary try/except statement, rather than letting the deferred catch them first. There isn’t necessarily anything wrong with this strategy, but it’s instructive to see how we might do this differently. Let’s suppose we wanted to let the deferred catch both GibberishError and ValueError exceptions and send them to the errback line. 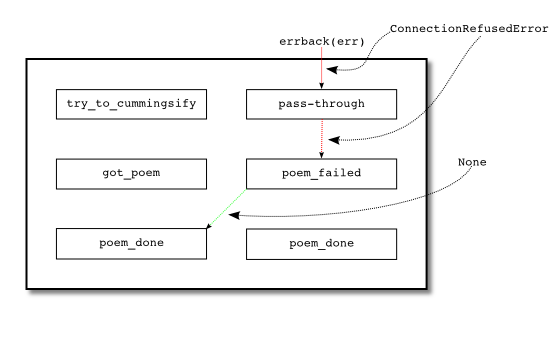 To preserve the current behavior our subsequent errback needs to check to see if the error is a ValueError and, if so, handle it by returning the original poem, so that control goes back to the callback line and the original poem gets printed out. But there’s a problem: the errback wouldn’t get the original poem, it would get the Failure-wrapped ValueError raised by the cummingsify function. To let the errback handle the error, we need to arrange for it to receive the original poem. 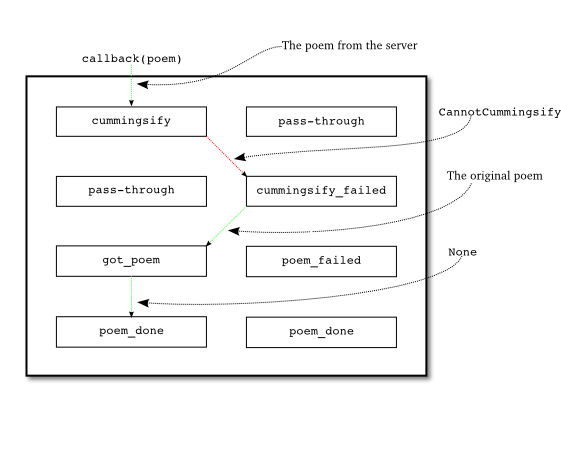 One way to do that is to modify the cummingsify function so the original poem is included in the exception. That’s what we’ve done in client 5.1, located in twisted-client-5/get-poetry-1.py. We changed the ValueError exception into a custom CannotCummingsify exception which takes the original poem as the first argument. We are using the check method on Failure objects to test whether the exception embedded in the Failure is an instance of CannotCummingsify. If so, we return the first argument to the exception (the original poem) and thus handle the error. Since the return value is not a Failure, control returns to the callback line. Otherwise, we return the Failure itself and send (re-raise) the error down the errback line. As you can see, the exception is available as the value attribute on the Failure. So when we are using a deferred, we can sometimes choose whether we want to use try/except statements to handle exceptions, or let the deferred re-route errors to an errback. 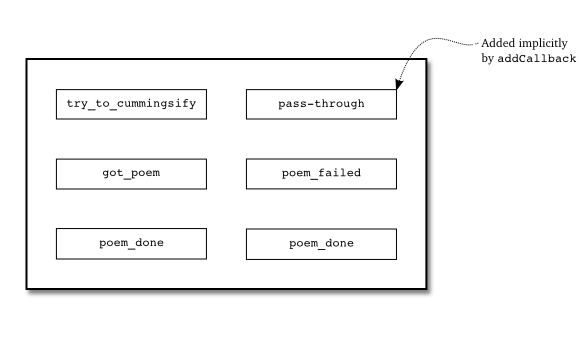 In Part 10 we updated our poetry client to make use of the Deferred‘s ability to route errors and results down the chain. Although the example was rather artificial, it did illustrate how control flow in a deferred switches back and forth between the callback and errback line depending on the result of each stage. So now we know everything there is to know about deferreds, right? Not yet! We’re going to explore some more features of deferreds in a future Part. But first we’ll take a little detour and, in Part 11, implement a Twisted version of our poetry server. Figure 25 shows one of the four possible ways the deferreds in client 5.1 can fire. Draw the other three. Cummingsifying? Now you’re just pandering. Break up your computation into chunks and use, for example, LoopingCall to periodically make progress on the work. Use deferToThread to run the computation in a thread. Use ampoule, a third-party package that lets you send work to sub-processes. Thanks! Looks like deferToThread is best option. BTW, are you planning to show how to write unit tests for server/client? Hi again, Dave, I’ve completed your excellent tutorial and I think I’ve understood most of it. As I commented in a previous chapter, most of the twisted tutorials in the web are outdated (I always find the “From twisted.internet.app import Application” at the beginning of the examples). projects that are working with twisted and that might be a good knowledge source if I take a look at their code. I’ve recently subscribed to the twisted-python mailing list, and I’ve digged into the twistedmatrix documentation and, as for me, it’s been almost impossible to find real examples of code using the current twisted api (even in the twistedmatrix documentation faq I’ve discovered code that doesn’t work now when I tried to test the persistence examples). Also, doing “apt-cache rdepends python-twisted” in my computer, it only gives very few twisted projects. Thanks again for this wonderful tutorial. I’m looking forward for future sequelas. Hey José! You are welcome, I’m having a lot of fun writing it. I didn’t think it would be this long, but I can’t seem to stop. When it comes to reading Twisted code, I really recommend starting with Twisted itself, especially some of the ‘outer layers’ like the protocol implementations. Since this code was mainly written by the Twisted authors, it’s a great example of how to use Twisted the right way. After that, you might check out this page on the Twisted website that lists quite a few projects that use Twisted. Hi, I was wondering whether creating an advanced asynchronous port scanner using twisted could be a viable GSoC 13 project? Like including some of the advanced Nmap features? Whats your take on this? I mean to say, that will Twisted benefit from a port scanner? Like some other component in twisted could actually use it with purpose. The Twisted developers would have the final say on that, of course, but my guess is that they would not be interested. A port scanner is a very specialized piece of networking code, very few applications would actual need it (aside from a port scanner itself). Thanks again for your wonderful guide to the twisted world. When I was reading the example of the part I think of the idea to send the deferred as deep as to the PoemProtocol. In this way the will not bother the factory to transfer the call chain. In my thought it is more straight to keep a factory only deal with the creation of protocols. Is it a good idea to allow the protocol to communicate with the application layer by the deferred? Or is it a more common practice to wrap the protocol in the factory and make the factory a proxy of all the protocols it creates? I think it’s reasonable to have the protocol talk to the application layer, especially in the case of a client connection where the factory is only ever going to make one connection. There are Twisted APIs for that situation that allow you to connect with only a protocol. Fantastic tutorial. Your approach really crystallizes Twisted’s approach to async, especially all the otherwise “odd” helper functions implemented in many of the Twisted examples. As an aside, this would be a great place to reintroduce (or use) trap(), which is only mentioned in the suggested exercises of part 6. Since I had already reviewed some Twisted stuff before finding this tutorial, I didn’t read the Suggested Exercises in earlier chapters and was surprised when it wasn’t used here. Thanks very much! Good suggestion, will see about incorporating that if I can get some time. I didn’t get how you are returning two values here, err and err.value.args. Why do we need to return err.value.args seperately? 3. If we don’t raise the exception, then errback in the next stage will not be called. Is this correct? I’m trying to understand Fig 22. That’s right, if a callback returns normally (no exception) then the next callback in the chain will be executed. Otherwise, the next errback will be executed. Hello! So that function is not returning two values. Only one return statement in a function can ever be executed, because a return statement causes the function to end immediately with the given value as the result of the function call. So the function in question will return in one of two ways, depending on whether the error is is handling is a CannotCummingisfy error or some other kind of error. And the code is defining the exception, see here.